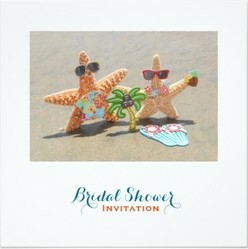 Here are my five favorite starfish bridal shower invitations. Why? Well they use starfish in creative and downright cute ways. I love to see starfish in the sand and in the waves. Zazzle designers also use them as bows and and embellishments on lace. These are all easily customized templates. They are unique and you won't see them at every beach themed beach wedding shower. These two starfish are ready to party! Sunglasses, flip flops and their very own palm tree. The Jack starfish has a Hawaiian shirt on and the Jll starfish has on a lei. If the couple has planned a destination wedding in Hawaii, you can't find a better bridal shower wedding. Quite frankly if the couple is getting married on a US beach, this is still an adorable invitation. I have been to many mainland beach weddings were people wore Hawaiian shirts and leis. This is just a fun way to invite people to a beach-themed Jack and Jill couple bridal shower. Okay I get it that not everyone is ready for party-hearty starfish. The rustic-chic, driftwood inspired bridal shower invitation is perfect a quieter, more sophisticated beach-theme wedding. White-washed wood is the background. A navy blue border defines the bridal shower information. Two starfish are at the top. Their arms are intertwined. Bridal Shower is in an ornate blue font. The bride's name is in the same font, just a bit smaller and in sand brown. All of the information follows in easy-to-read capital letters. Formal font gives this bridal shower invitation a very elegant look. Two large starfish are romantically arranged at the top of the invitation. The background begins with deep blue ocean water. Then waves move gently along the sand. I just imagine how romantic it is to walk a beach like this with my husband, whenever I see pictures like this. This is a two-sided wedding invitation. The front is a pretty aqua blue. It has two very pretty transparent ribbons that run down along the right and across the bottom. Zazzle artist sandpiperWedding has put a starfish photograph where they intersect. The words Shower for the Bride are in the upper left corner. You can easily personalize this with the bride's name if you choose. The back is white and has all of the bridal shower information. The same starfish is on the bottom of this side. It's a bit smaller. I love this bridal shower invitation because of the gorgeous blue marble background and the way that the artist used the white swirl to look like a wave. I honestly think it's like a gossamer ribbon. Whatever it is, the starfish look beautiful on it. White lettering showcases Bridal Shower and the bride's name. The back is in the same blue marble pattern, but without any words. Starfish make a cute representation of the couple. I love starfish (sea stars) too! These starfish invitations are adorable, Digby. I can't decide which one is my favorite.